businesses) all of were enacted into law in May 2017. All Share Index (ASI) and Market Capitalization declined by 13 percent to close at 23514.04 points and N8.09 trillion respectively at the end of the trade session on January 15. The huge drop in the Index, representing a 3-year low, led to the introduction of the Index Circuit Breakers Rule. 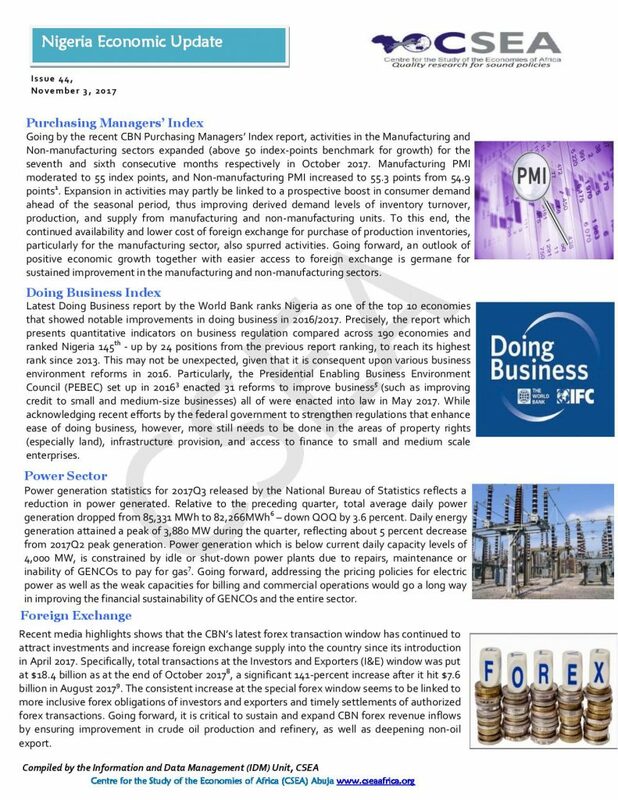 While this policy measure may prevent huge losses in the stock market, rising concerns about macroeconomic stability in Nigeria may significantly increase the level of volatility in the stock market. This may have substantial adverse implications for investors in the Stock Exchange. Latest figures of FDI flows to Nigeria show a decline of 27 per cent from $4.7 billion in 2014 to $3.4 billion in 20152, representing its lowest value since 2005. This decline is largely attributed to the oil price slump, which has generally increased uncertainty in the economy, with adverse effects on investors confidence. The fall in FDI flows was witnessed in most resource based economies in Africa, as FDI flows to the continent fell by 31 percent in 2015. The forex controls in place in Nigeria has also exacerbated the uncertainty in economy, and created obstacles for both domestic and foreign investors. Thus a review of the forex restrictions could send positive signals to investors.